SALE PENDING $345,000 Affordable.....and classy!!! "This opportunity is just "Right"!" 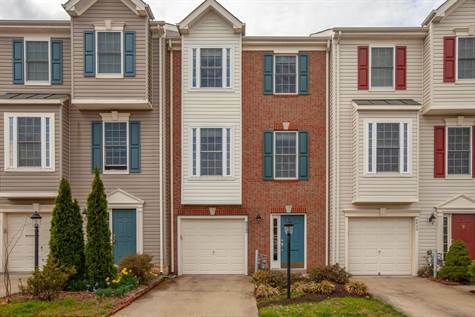 Style: Townhouse "Brick & Siding"
Bedrooms: 3 "Spacious upper level "
Bathrooms: 2 "2 Upper level"
Garage: Single, Attached "1 Garage door opener"
Basement: Yes, Walkout "Recreation room - laundry space "
Size: 1,988 sq. ft. "Three finished levels"
Year Built: 2006 "Well Maintained "
Classic three finished level brick front Abby model built by Lennar Homes * 3 Bedrooms * 2.5 Baths * Hardwoods * Ceramic tile * Box Bay * Custom molding * Custom blinds * Bountiful recessed lights * Gourmet kitchen offers granite counter tops, tile back splash, stainless steel appliances, upgraded cabinets, kitchen island * Economical gas cooking, heat, and hot water * Walk out recreation room to enclosed rear yard * Custom deck * You will be pleasantly surprised to find you have found YOUR home!